Happy Friday! You may have seen this festive cake on Instagram last week, and I just wanted to write a quick post about it for you guys! 4th of July is almost upon us. I know you’re probably already planning out your menus and thinking about delicious things to grill. But dessert is also important, right? This cake is not only fun to look at, but I seriously had fun making it! It’s six (six!) layers with ruffly frosting and tiny, silver stars. The decorations were inspired by a lot of the ruffly 4th of July decorations that people usually put up. I hope you know what I’m talking about, haha. 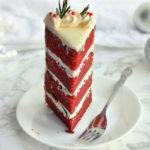 The layers are fairly thin, with thin layers of buttercream frosting. I baked these two layers at a time, which works really well if you only have two 8 inch cake pans. I have four, so I reused two of them. Disposable aluminum cake pans would also be a good option here if you can find them. 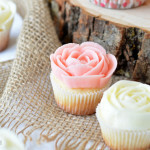 For the recipe and the instructions, check out the post on Best Friends for Frosting! Oh my gosh what an amazing cake!! I have no idea how you are able to get so many perfect layers, mine never turn out quite as pretty 🙂 Love how you decorated the outside too! And such fun colors for the Fourth! Wow 6 layers! Amazing, And you got the colors spot on. Love how you did the frosting on top! This is one epic cake, Beth! Seriously so beautiful. I’m loving everything about it, especially those tiny silver stars. Hope you’re having a great weekend ahead! How cute is this!!! 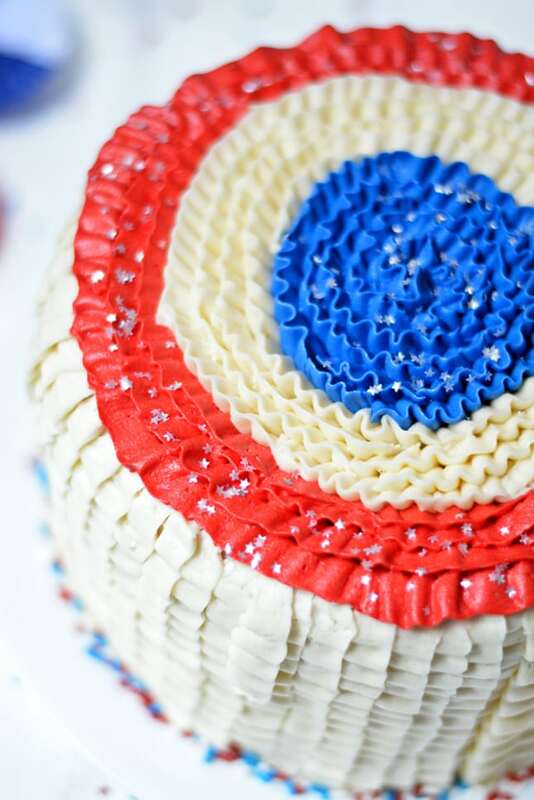 I need to make something cute for the 4th with all my friends at school, and this must go on that list. Love!! I’m loving all the layers and colours in this cake, I bet it took some time to put together. Looks so professional! Love love love this cake! How fun and festive!! Going to check out the recipe now! Oh oh oh! I’m SO excited for the Fourth of July! 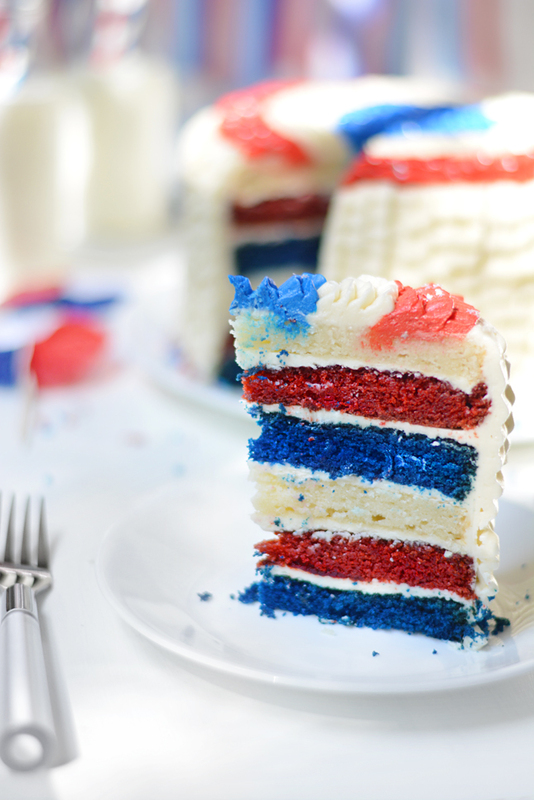 This cake needs to happen – who can say no to all those fun layers and colors! 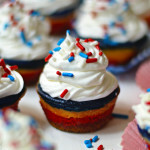 Super festive and the buttercream frosting is awesome! Love this! 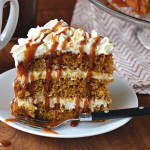 Yet another of your recipes that I’ll try to make for our family gathering for the 4th. How beautiful!! This is a gorgeous cake Beth. 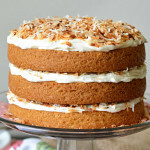 Your layers and frosting came out perfectly! The combination of favors in this cake was WONDERFUL! It tasted every bit as good as it looks! Wow that is one serious looking cake Beth! I’m super impressed by your ninja baking skills! That cake must of tasted amazing!!! Really pretty!!! 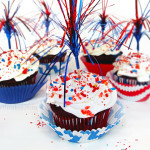 I was thinking of making red, white, and blue cupcakes. Well, isn’t this beautiful cake a sight to behold! I am in love with that ruffly frosting and fun colors inside. What a perfect way to celebrate the Fourth! Ahhhh!!! This is so beautiful!! What a great, fun, festive recipe!! Talk about a great way to celebrate! 🙂 So fun! what more can I say that hasn’t already been said – PERFECT. this is everything a July 4th bbq needs, seriously dying over how incredible this looks!!! What a gorgeous cake, Beth! 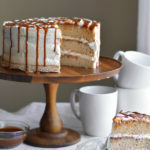 BFFF is so lucky to have you as a contributor because your cakes and treats are always amazing! Wow, this cake is absolutely gorgeous! Love the colours- so amazing!